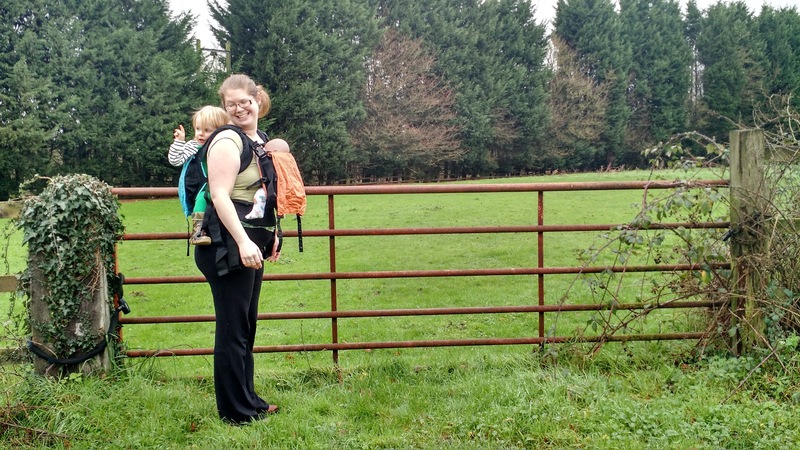 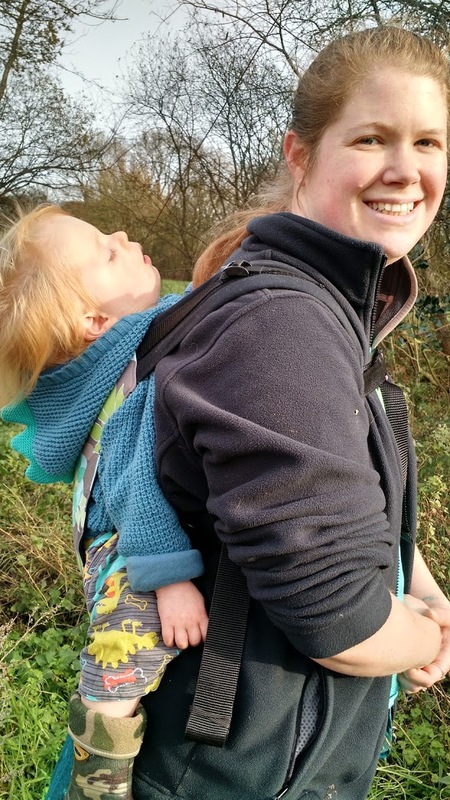 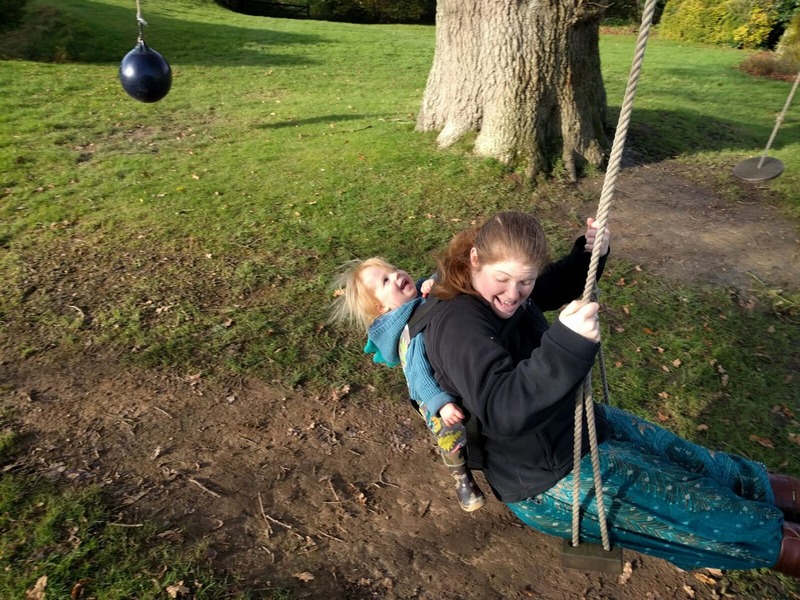 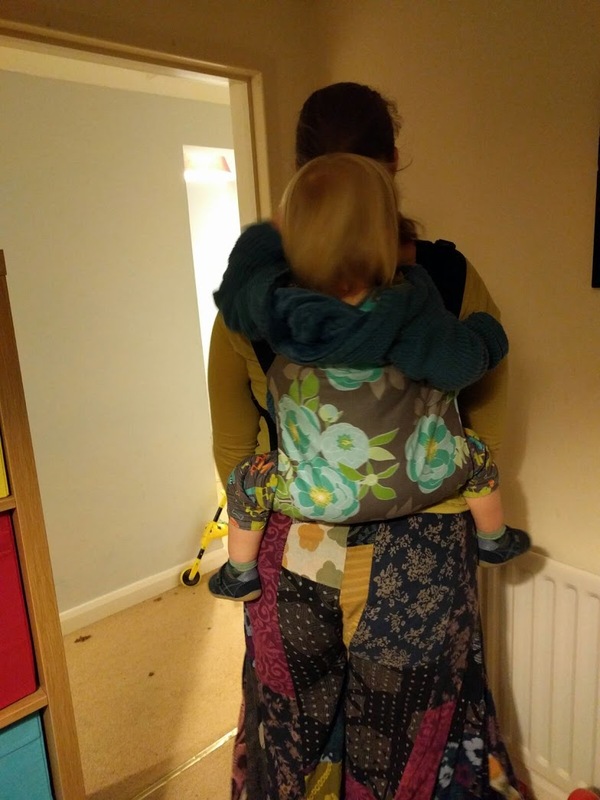 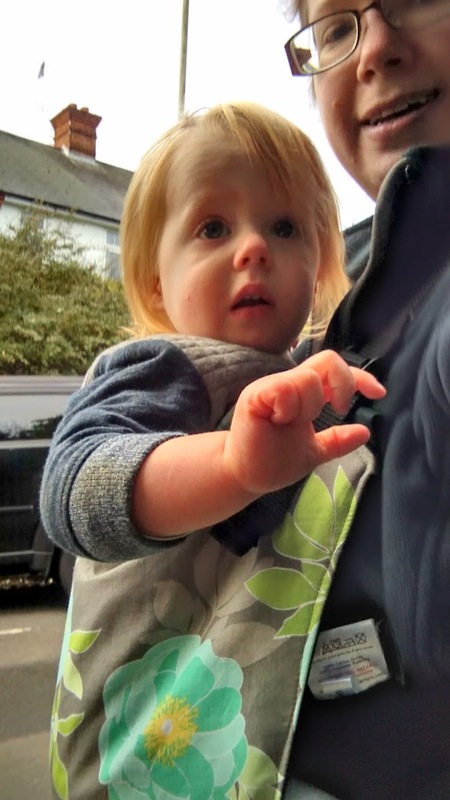 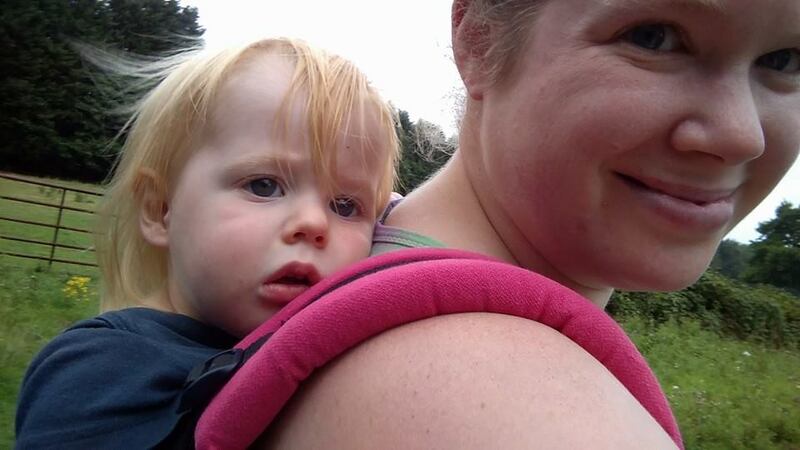 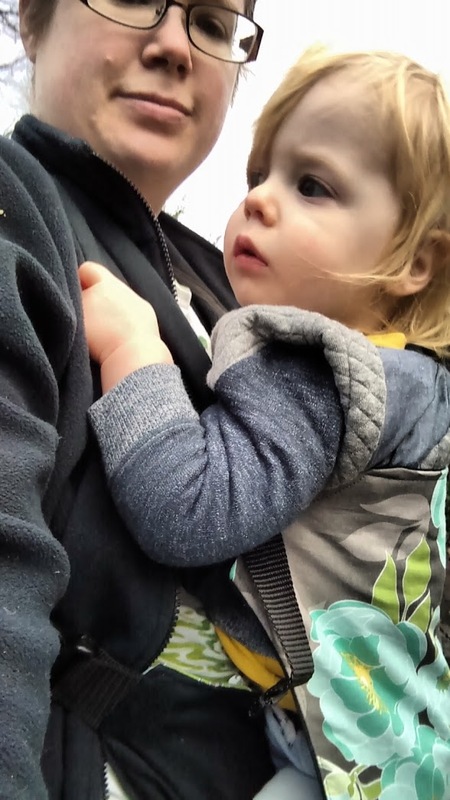 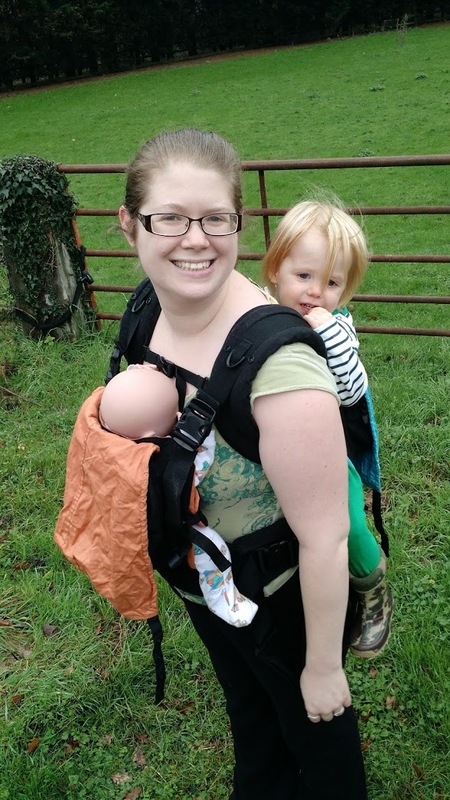 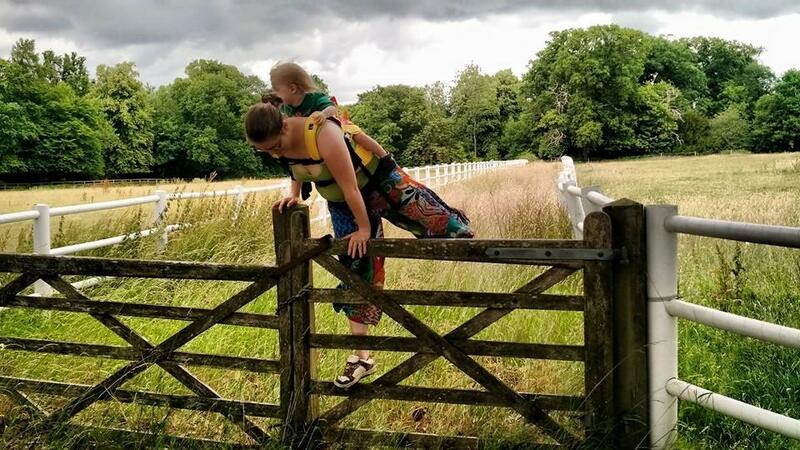 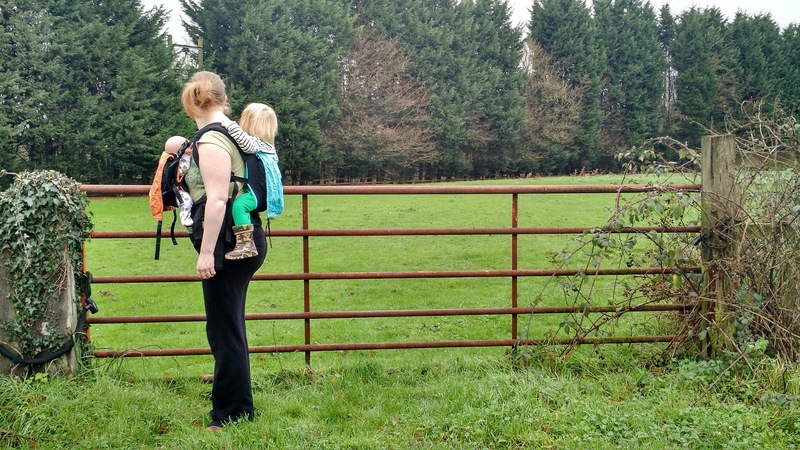 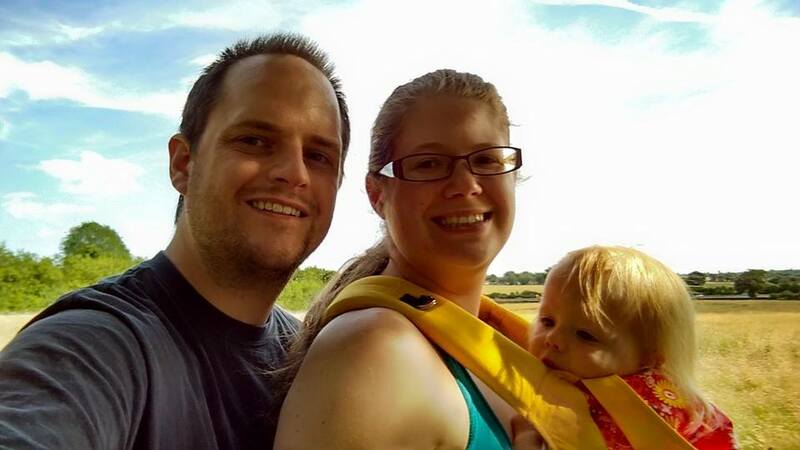 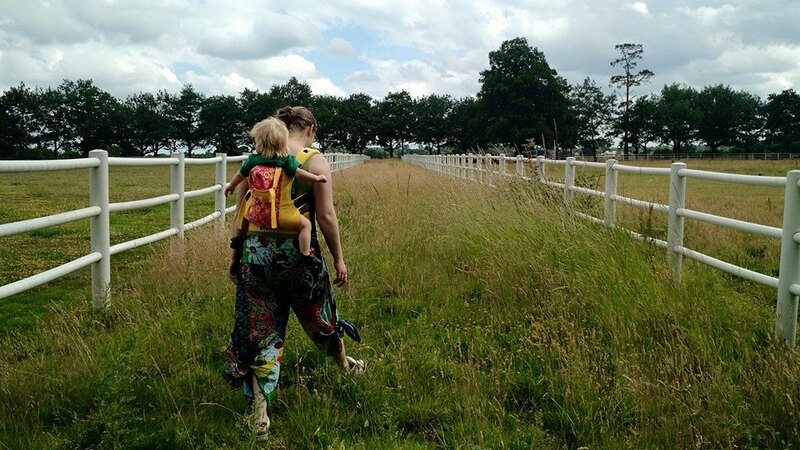 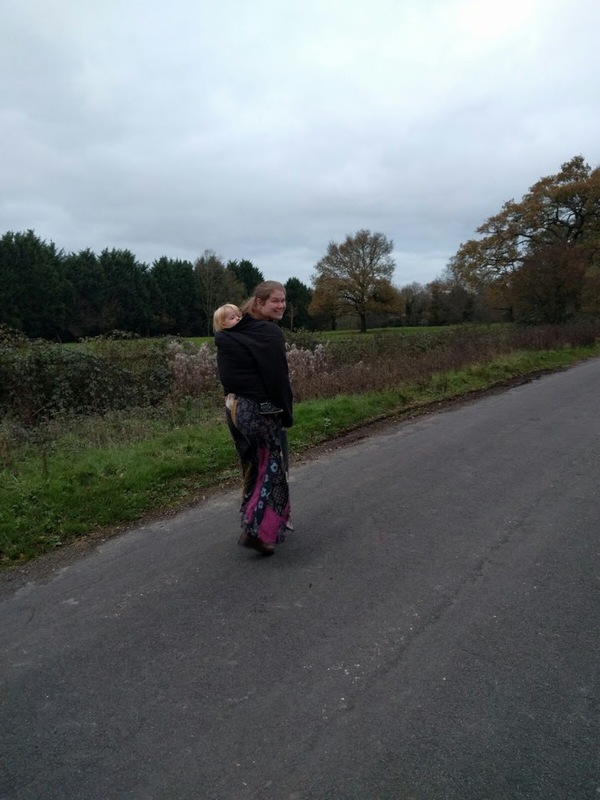 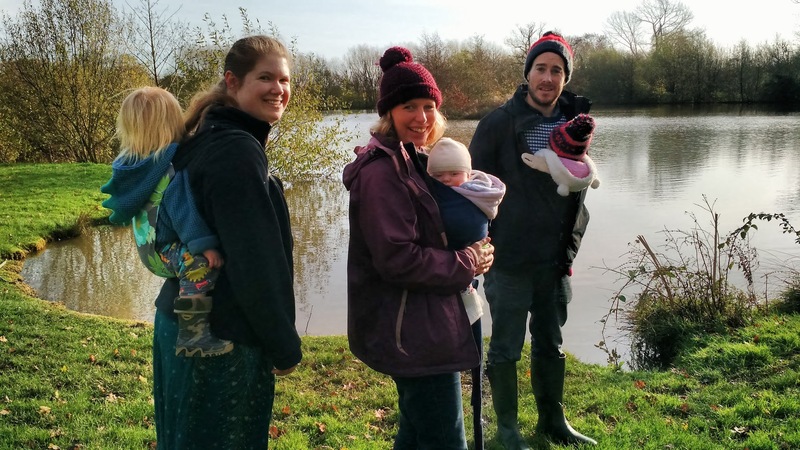 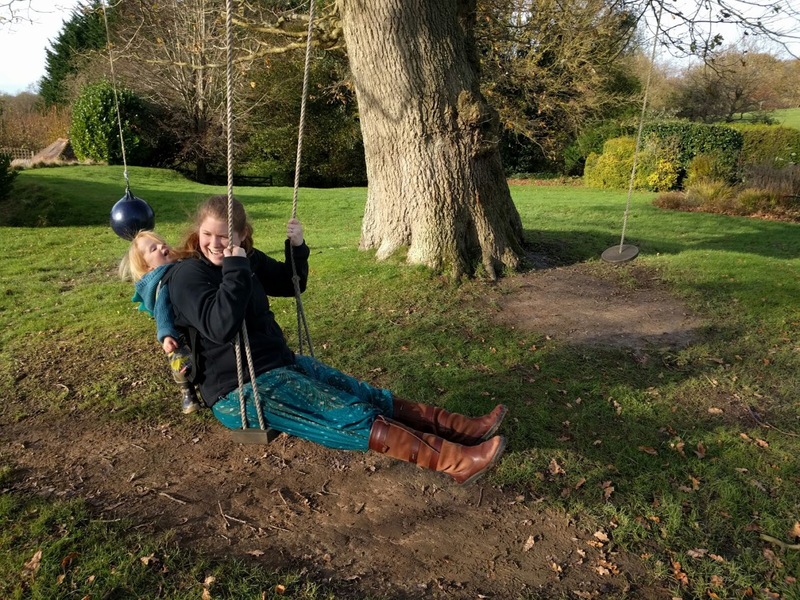 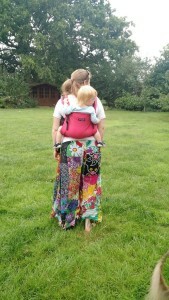 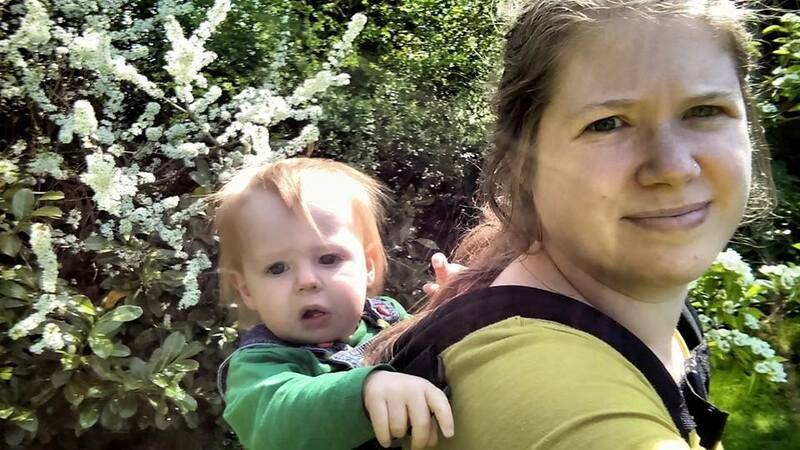 We had a twingo carrier come and visit for a few weeks recently and I loved it, both as a twin carrier, but also as a tandem carrier for differently aged/sized babies and children. 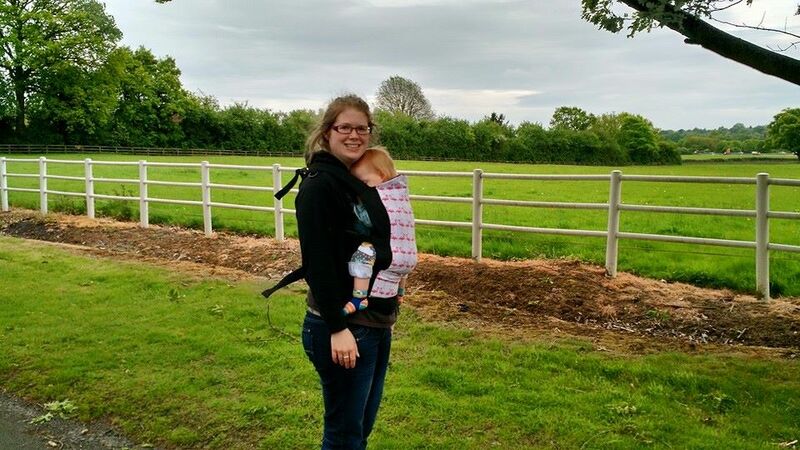 There has very clearly been a lot of thought gone into the design of the TwinGo to make it work in different ways and in different situations. 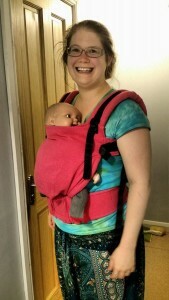 The Twingo can be used either as one carrier that carries two babies, one on front and one on the back (if there is a weight difference of 3lbs or more the heavier baby goes on the back), or as two separate carriers used on either the front or back, so that two parents/caregivers could share the carrying, or easily swap back to one carrying both babies as needed. 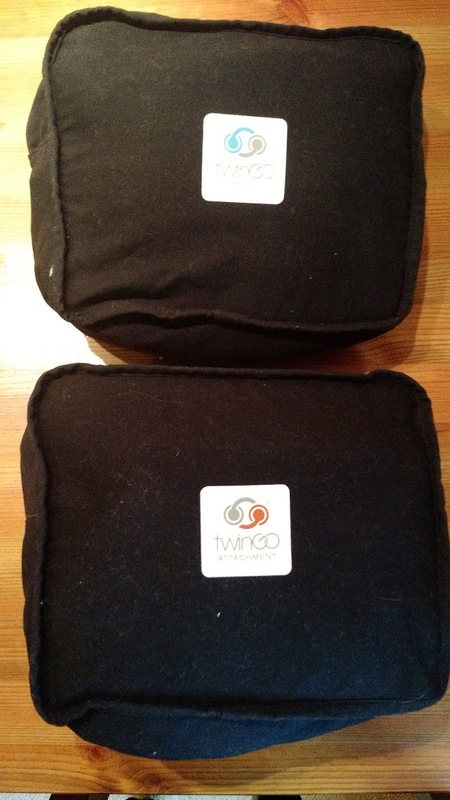 The Twingo comes as two carriers, the base and attachment carriers, and both pack down neatly into their own integral storage bags. 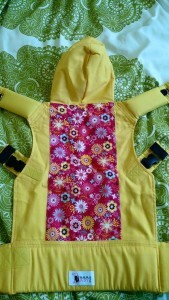 These are also colour coded both on the bags and the sleep hoods for easy recognition. 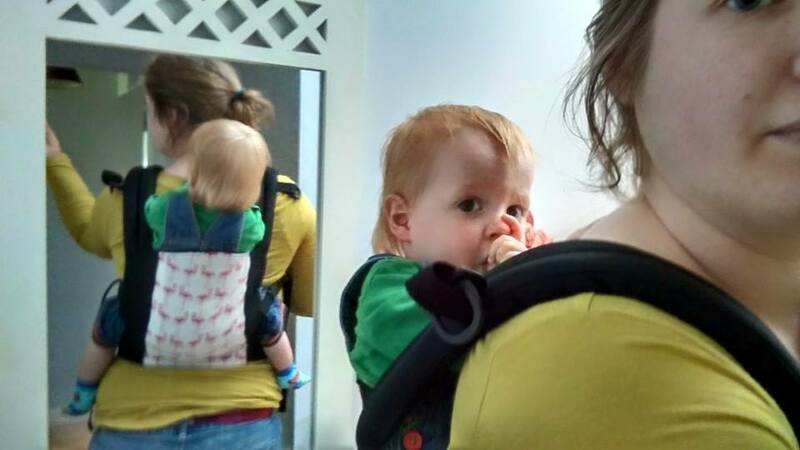 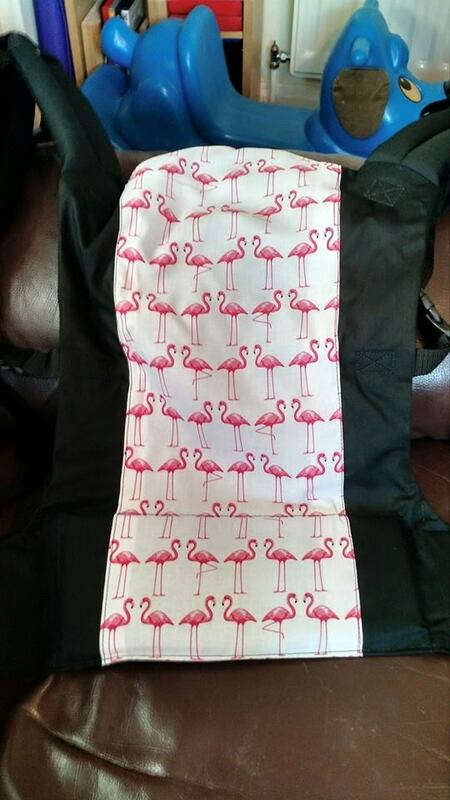 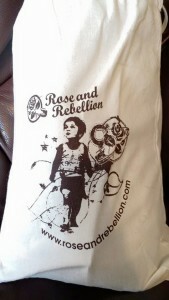 When in use as carriers, these bags provide handy and spacious storage compartments for nappies, muslins etc. 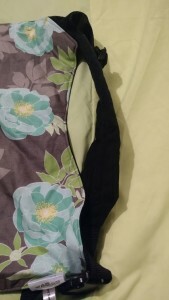 The waist band is well padded and structured without being overly rigid, and when both carriers are in use together, this support extended the whole way around my size 14 waist. 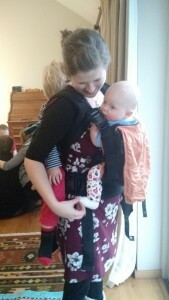 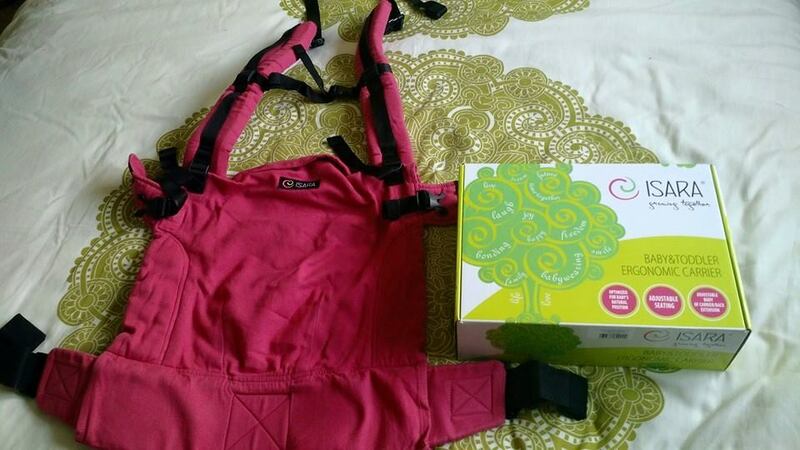 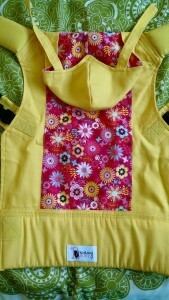 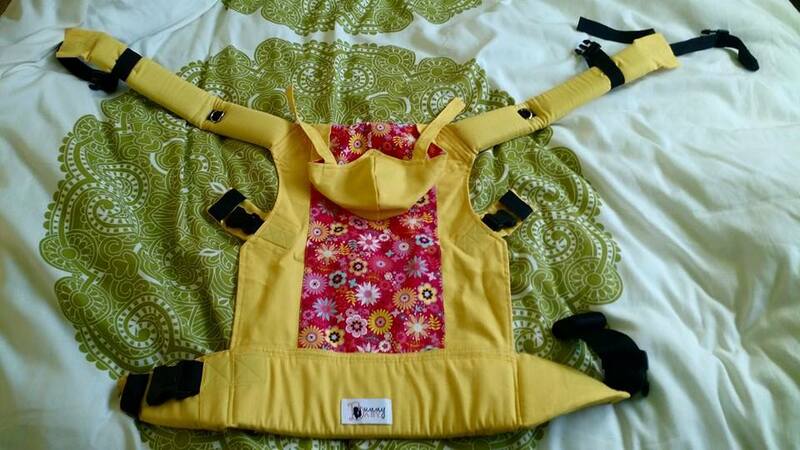 The shoulder straps have a generous level of padding to help comfortably spread the weight of two babies/children. 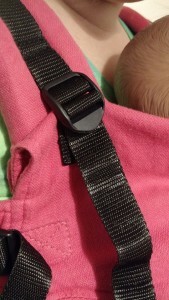 There are also safety elastic loops on the buckles for extra security. 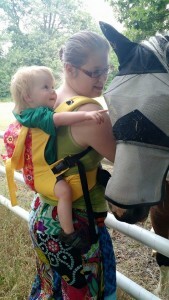 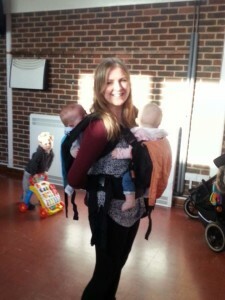 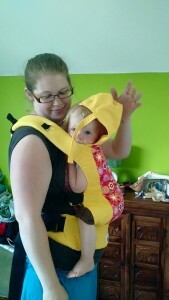 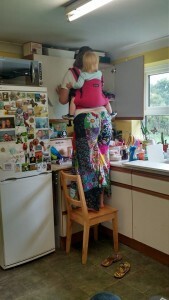 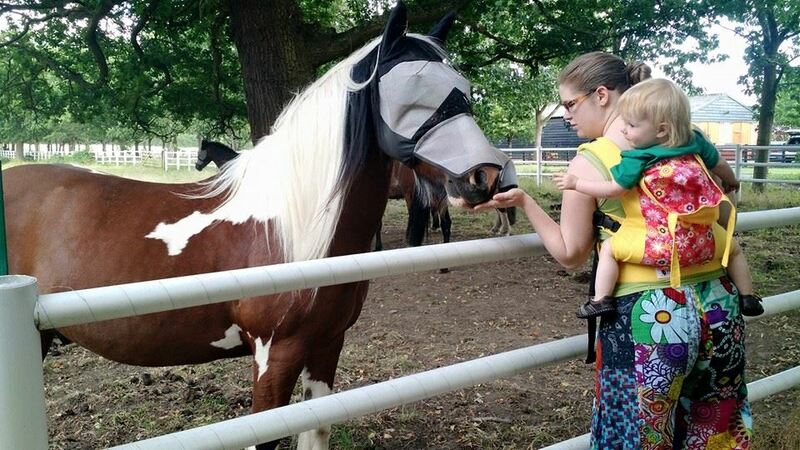 I was very impressed with how easy such a versatile carrier was to use. 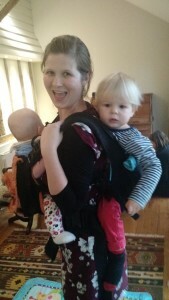 As individual carriers the base carrier is ready to go just like other buckled carrier options. 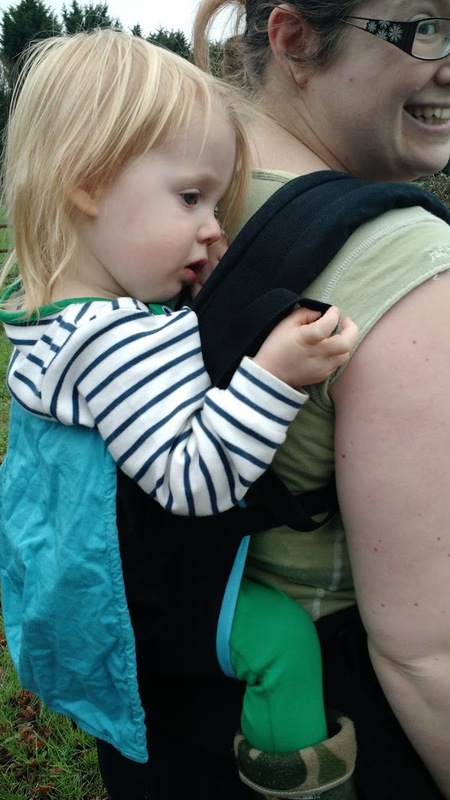 The attachment carrier has straps to buckle on the make it work as a stand alone carrier, but these fit in the integral storage bag with plenty of space, so you don’t need to carry them around separately or remember to pack them for a trip out. 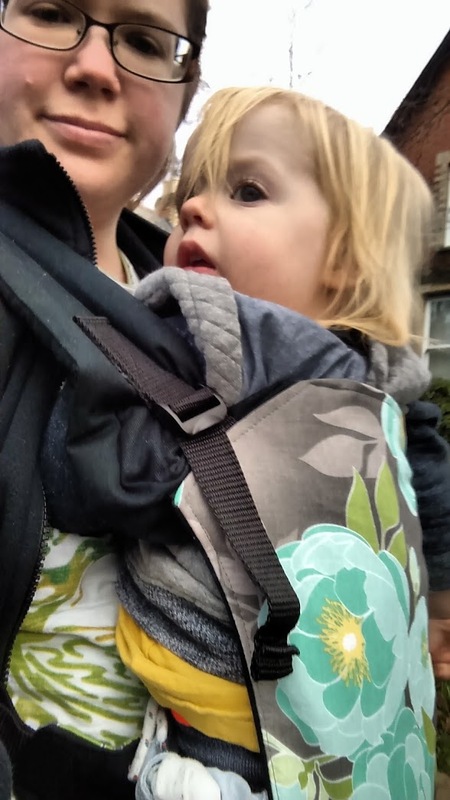 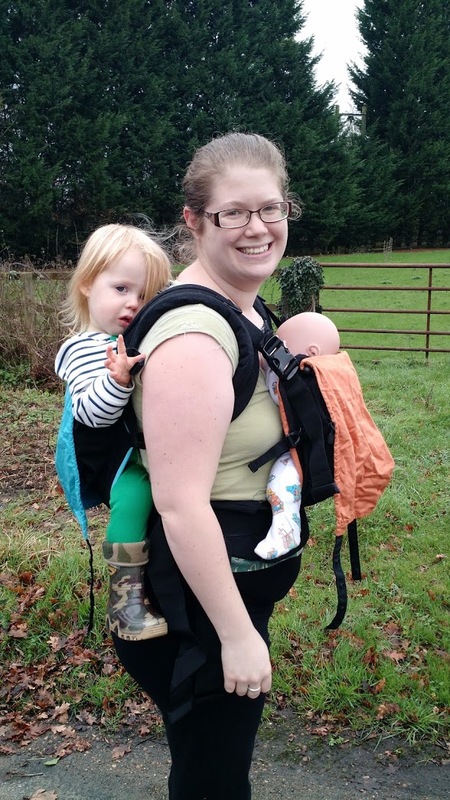 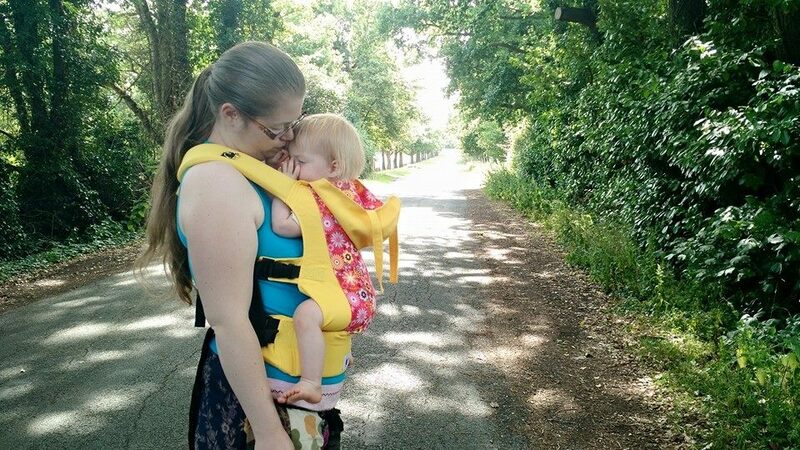 Using the Twingo to tandem carry front and back was impressively easy to set up – you just buckle the waist bands to each other so you have the base carrier on the back and the attachment carrier on the front (without the additional straps for solo carrier use). 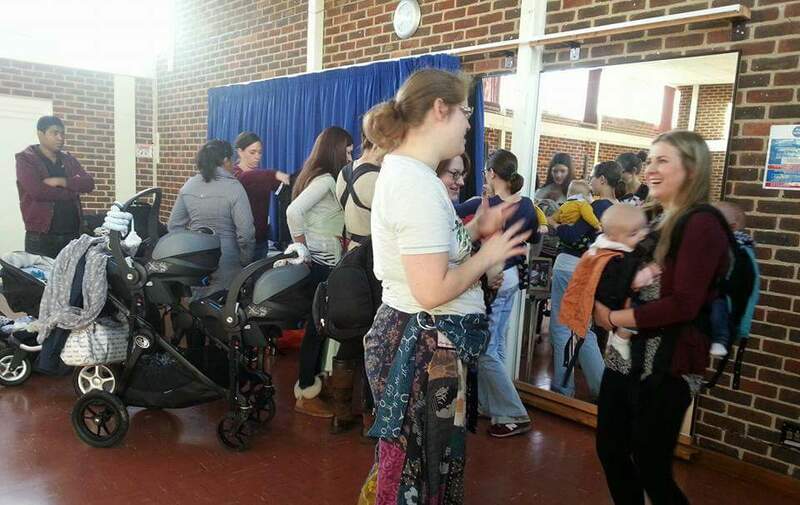 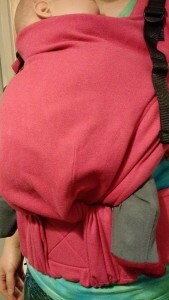 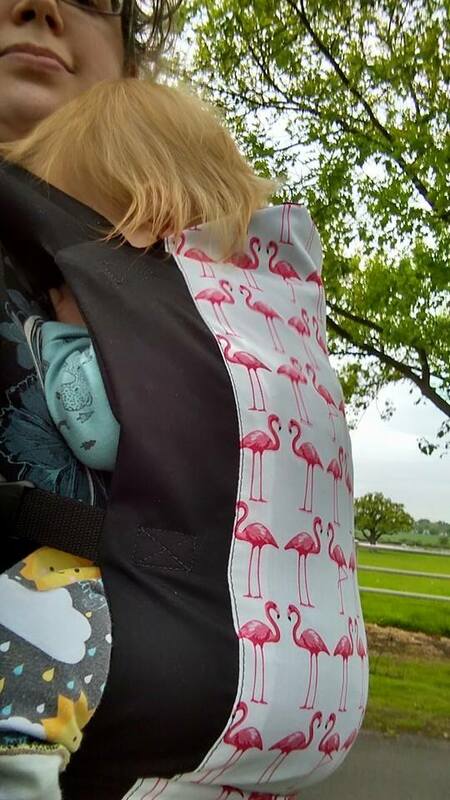 Put one baby on your back by whichever method you prefer (a hip scoot is a great method to start with), adjust the shoulder straps to be comfortable and fasten the chest strap. 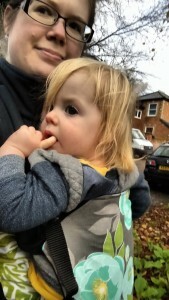 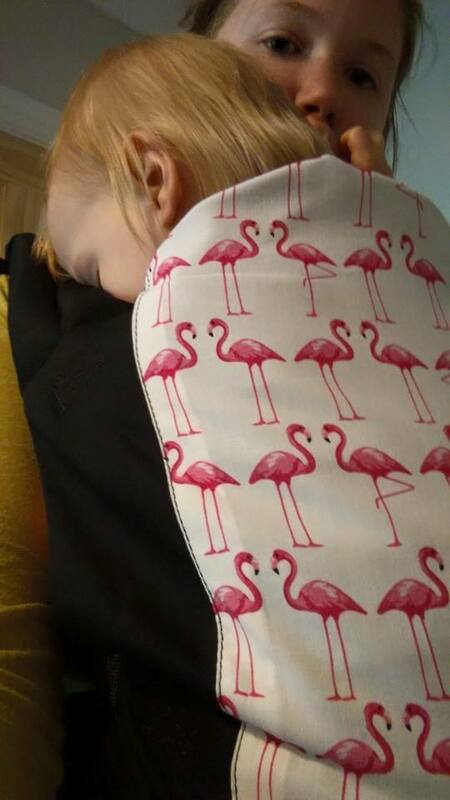 Then the second baby goes on the front, with the use of the safety strap, and the panel clips directly onto the shoulder straps from the base carrier. 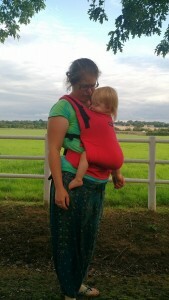 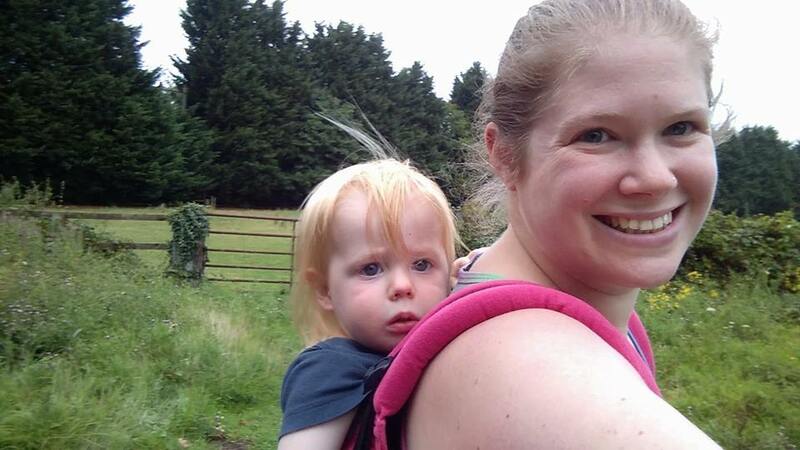 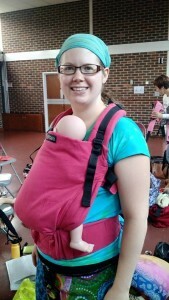 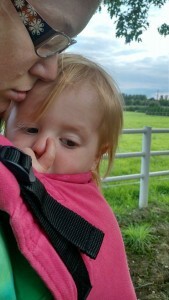 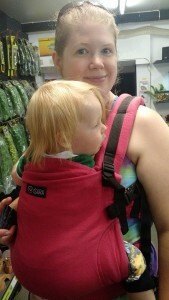 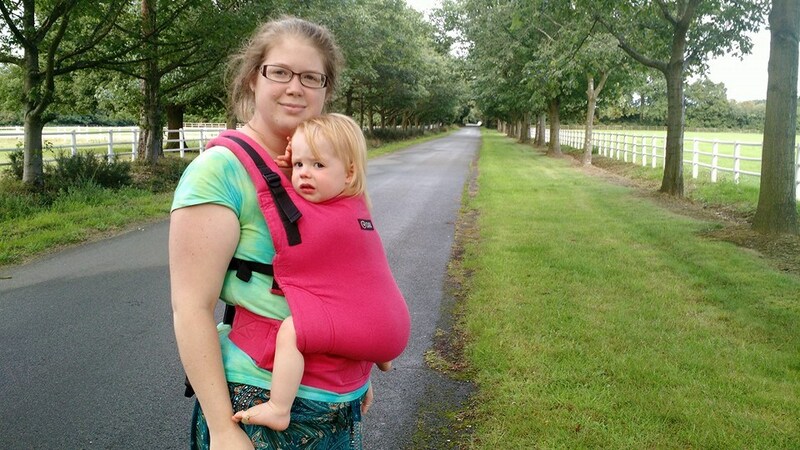 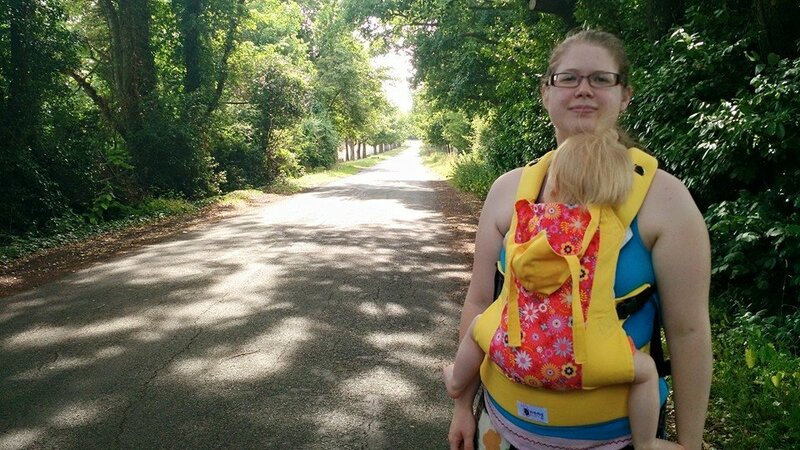 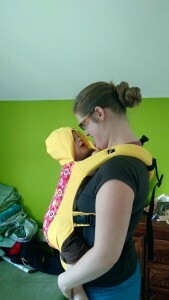 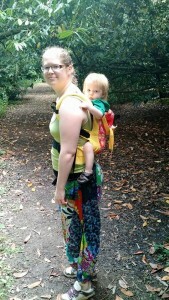 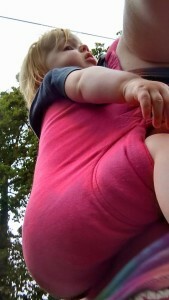 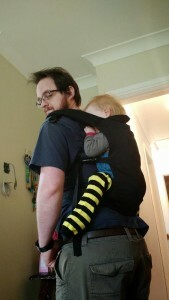 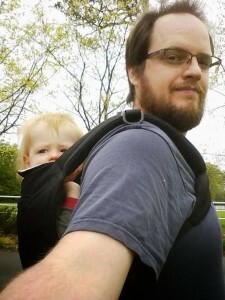 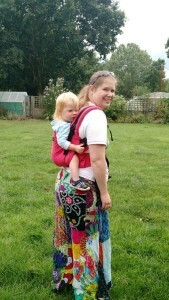 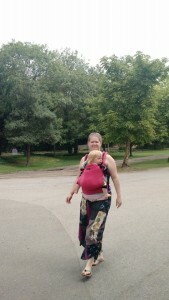 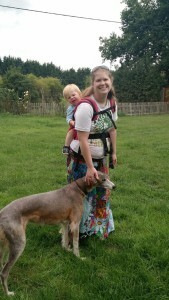 By having both carriers attaching to one set of shoulder straps this is much easier for the wearer to use and get comfortable, as you can easily move this one strap to your comfortable carrying position, and much easier than would be possible if you were using two separate buckled carriers and therefore had four shoulder straps to contend with. 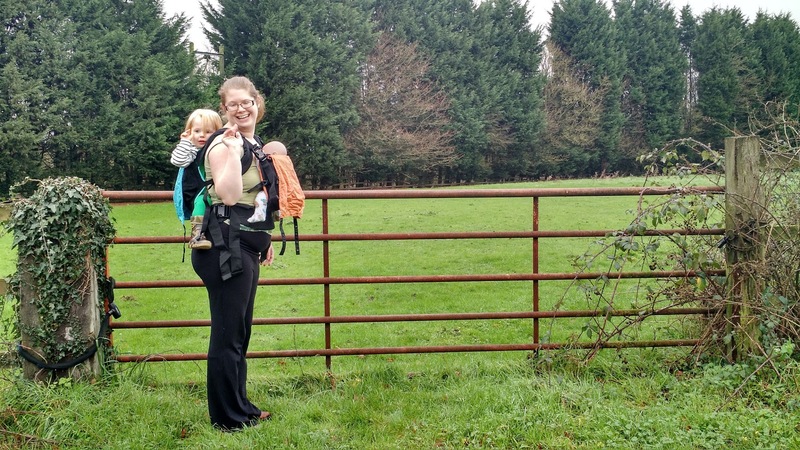 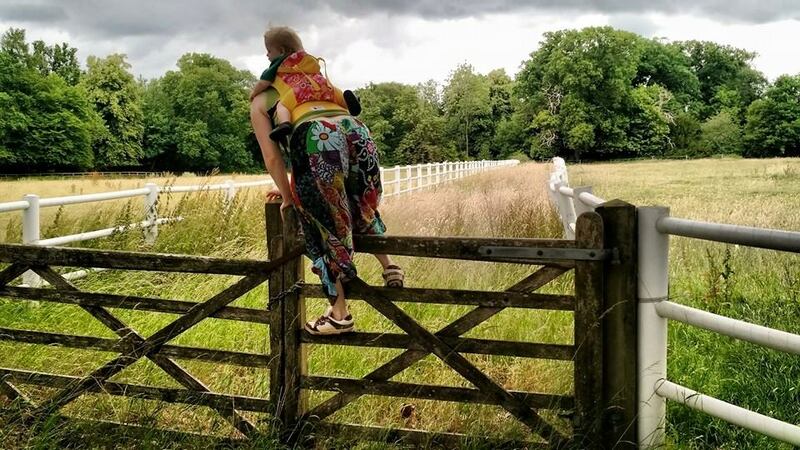 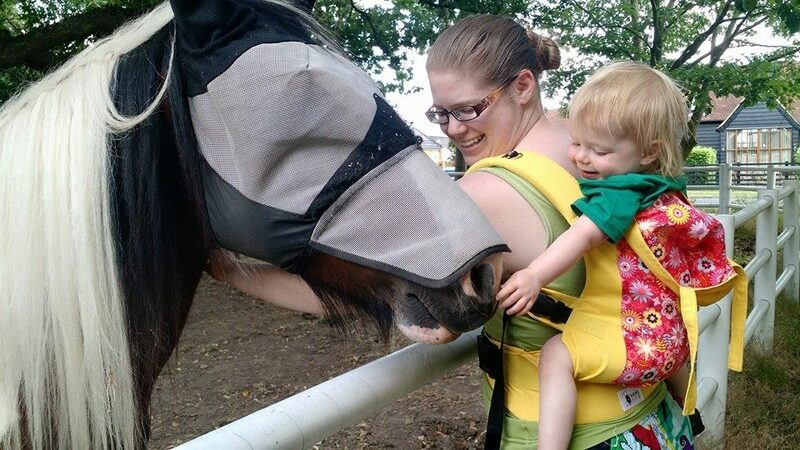 The shared waist band also makes for a much more comfortable carrying experience than two separate waist bands and buckles would if you were using two separate buckled carriers. 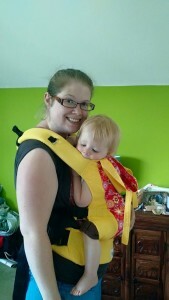 During the Twingo’s visit with us it attended some sling library meets as well as being tested by myself. 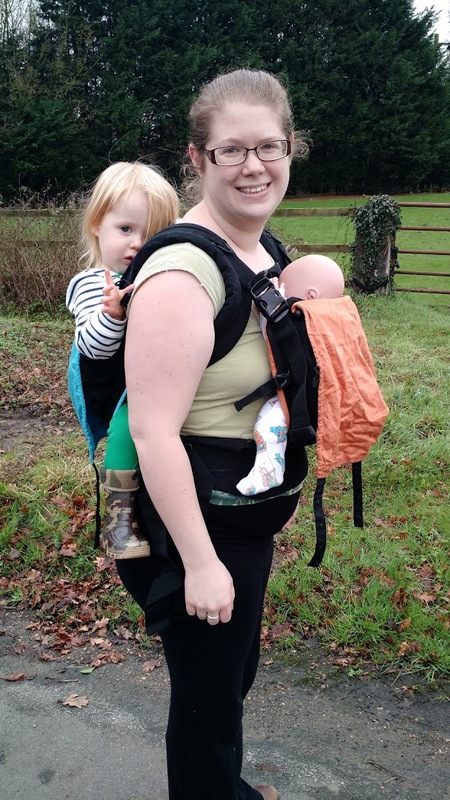 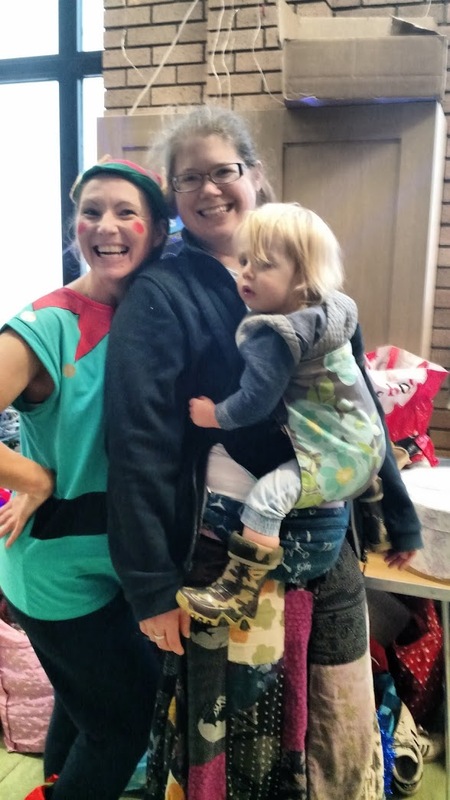 Everyone who tried it was impressed with how easy it was to use and how comfortable they found it – I believe one lovely lady with twins even got one for Christmas. 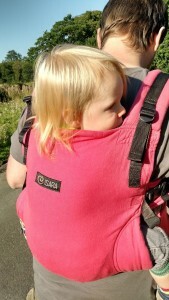 As I’ve mentioned above I was very impressed with the design and thought that’s gone into the Twingo, along with how easy it was to use as a tandem carrier or two solo carriers. 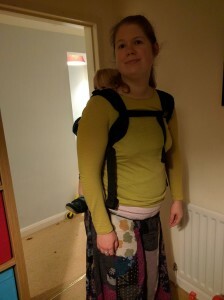 I found the waistband to provide a nice level of support and it was nice to have this support extending the whole way round when tandem carrying. 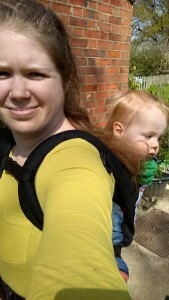 The shoulder straps were lovely and padded and I can see them remaining comfortable even with two larger children in the carrier. 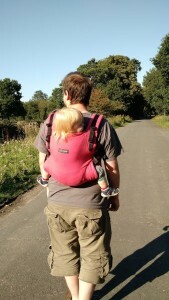 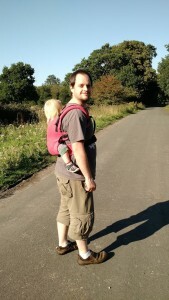 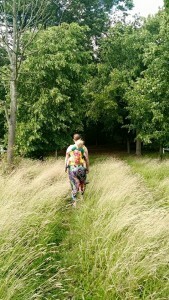 Overall, I think the Twingo is an excellent carrier and by far the best buckled tandem carrier that I’ve seen. 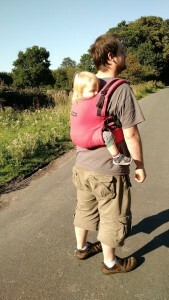 Some people may be put off by the price, but if you think of it as two separate ergonomic buckled carriers (which if you wanted to tandem carry in buckles you would need anyway), then it’s actually pretty averagely priced, and it’s well worth the money with all the thought and design features that have gone into the Twingo.